Sigma 18-200 F3.5-6.3 DC lens introduction : Sigma Corporation is pleased to announce the launch of the new Sigma 18-200 F3.5-6.3 DC lens. capable of covering a wide range of focal lengths from wide-angle to telephoto. Two Special Low Dispersion (SLD) glass elements and two hybrid aspherical lenses offer the utmost correction for all types of aberrations, and enables this extended range super zoom lens to be housed in a compact and lightweight construction of 70mm (2.8") diameter, and 78.1mm (3.1") in length, and weighing just 405g/14.3oz. The new lens coating reduces flare and ghost, which is a common problem of digital cameras and also creates an optimum color balance. 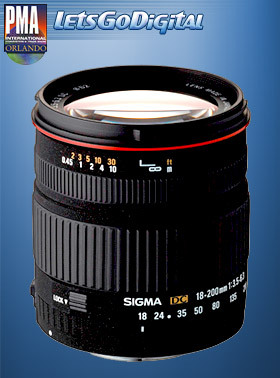 The Sigma 18-200 DC lens has a minimum focusing distance of 45cm (17.7") at all focal lengths and has maximum magnification of 1:4.4. The lens design incorporates an inner focusing system, which prevents the front of the lens from rotating, making it particularly suitable for using circular polarizing filters and petal shaped lens hoods. The overall length of the lens does not change during focusing, ensuring convenient handling and ease of use. A zoom lock switch eliminates 'zoom creep' during transportation, a convenient addition when travelling.